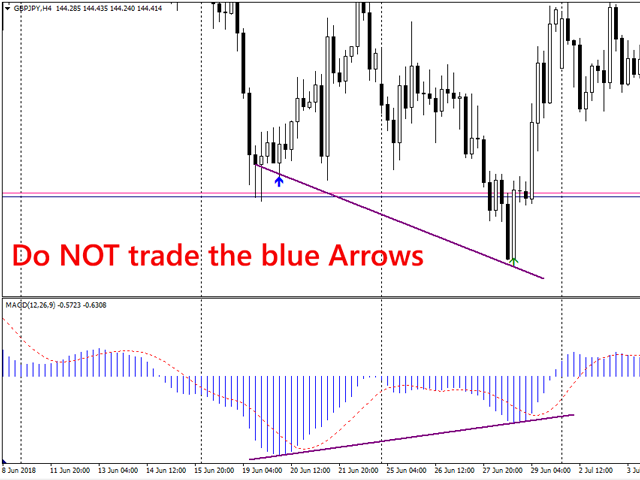 MACD Divergence with arrows complements the MACD indicator. 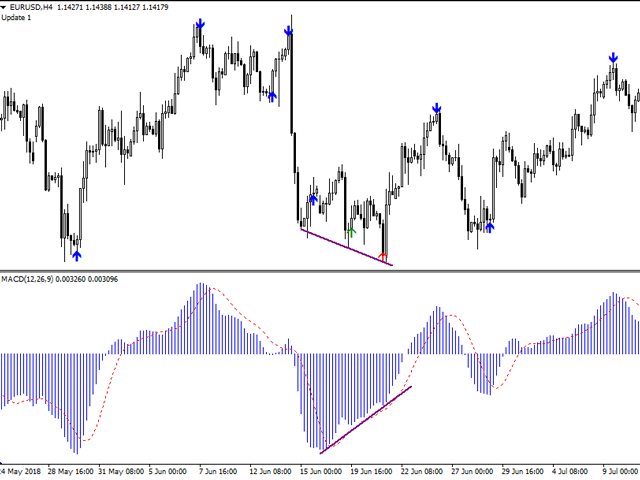 It scans for divergence within the MACD oscillator then draws the entry points in the chart window. The user will become alerted whenever a divergence is in progress and should WAIT for the perfect moment to make an entry. Perfect entries can be anything basic such as support and resistance zones (recommended) to complex strategies. 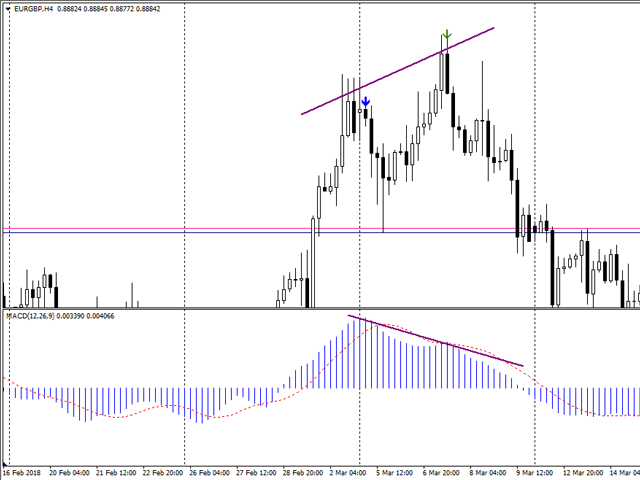 A divergence occurs when the market trend is opposite to the MACD indicator trend. It has been seen to be a common way to identify market reversals. 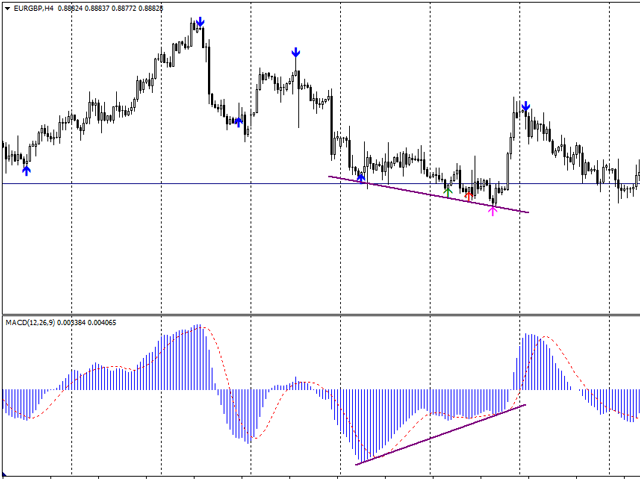 The MACD Divergence with arrows indicator will scan for divergence within the MACD oscillator. For a Buy: If the market drops lower but the MACD value rises, the MACD Divergence with arrows indicator will draw an arrow to show a divergence in progress. For a Sell: If the market rises higher but the MACD value drops, the MACD Divergence with arrows indicator will draw an arrow to show a divergence in progress. By default, the dark blue arrow indicates the lowest or highest points in the MACD oscillator. These points ARE NOT entry points. The first arrow which is green by default shows the lowest or highest point in the first divergence. It indicates an entry point. The Second arrow which is red by default shows the lowest or highest point in the second divergence. It indicates an entry point. The Third arrow which is magenta by default shows the lowest or highest point in the third divergence. It indicates a precise entry point. GOOD ENTRY POINTS OCCUR AROUND SUPPORT AND RESISTANT ZONES. Applied Price - in reference to MACD Applied Price. Email Alerts - Sends alerts to your email.